We made proper preparations spending too much money at the grocery store to supply Songwon Elementary with a proper Halloween. This morning another teacher brought oranges for all of us to eat. Getting food or gifts is a pretty common occurance here, so we figured we would finally reciprocate the favor. Lindsay handed the bag of candy to the teacher next to her, “We brought candy for the kids, but you all can take a piece from the bag.” After the teacher dumped the whole bag and half of our supply on the table in front of the other teachers, Lindsay modified her statement, “Okay, you can have a few pieces, but it is for the kids!” She nearly had to yell it over the chaotic grab for our candy. It looked like a 8 year olds birthday party after someone finally busted the pinata. I also likened it to throwing meat in the middle of a pack of wolves and asking them only to take a couple of bites. It was mayhem, and they took it all. Chalk it up to lost in translation or a cultural thing. Either way, I learned today that Koreans love some chocolate. We posted two new blogs….see below. Question: Why are all the kids’ glasses the same but in different colors? Are they all wearing glasses that are stylish? 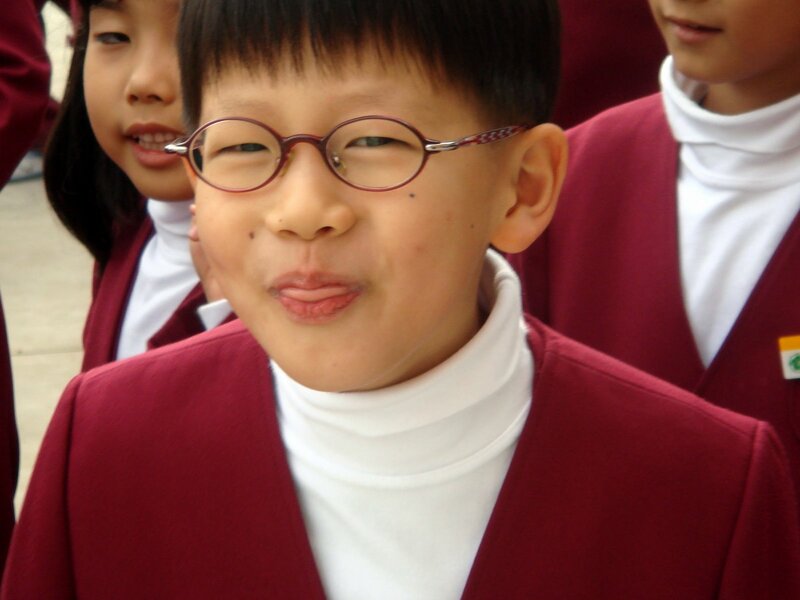 Seems like Korean kids should be like the rest of us and have to wear really ugly glasses as kids so they can spend the rest of their lives making fun of themselves! Summer. Great question. Yes, all of these kids’ glasses are stylish. But these are also the rich kids we are teaching. Not that all rich people have style. But they do have money. If it helps, they do all still pick their noses.